Jean-Baptiste Huynh — Woman — Portrait de la beauté Ends in 22 days: February 18 → May 11 Woman, projet artistique de Jean-Baptiste Huynh mené de 2018 à 2020, met en lumière la beauté du visage de la femme. Le portrait est au cœur de l’œuvre de Jean-Baptiste Huynh depuis 25 ans. Barry Flanagan — Solutions imaginaires Ends in 22 days: March 14 → May 11 Barry Flanagan (1941-2009) est, comme la plupart des grands artistes, difficilement « classable ». Sculpteur, dessinateur, graveur, installateur, il pratiquait l’art subtil et savant du contrepied, ce qui l’amena très tôt à s’intéresser à la ‘Pataphysique d’Alfred Jarry, cette « science des solutions imaginaires ». Nancy Spero — The Warriors Ends in 22 days: March 14 → May 11 Cette exposition réunit autour d’une longue frise de quatre mètres, The Warriors, présentée sans cadre comme l’aimait l’artiste plusieurs œuvres sur trois décennies (1966 à 1996). Jean Dubuffet — Estampes Ends in 22 days: March 14 → May 11 Cette exposition réunit des œuvres de diverses périodes de l’artiste : des lithographies de 1944 (Matière et mémoire) aux sérigraphies des Faits mémorables de 1978 en passant par de savoureuses figures à chapeau des années 50-60 et de superbes épreuves de ses « expériences lithographiques » de 1958-59. Archives Jaume Plensa — Kiki Smith — Barthélémy Toguo Past: January 24 → March 9 The human figure, which had been somewhat overlooked in favour of triumphal abstraction, is now back with a vengeance in contemporary artistic production. Three artists of the same generation, but coming from different traditions and horizons, illustrate here their contrasting visions of the human figure. Archives Jaume Plensa — Nouvelles estampes Past: January 24 → March 9 For more than 30 years, Jaume Plensa has accompanied his work as a sculptor with a substantial body of etchings, which have already been the focus of a number of retrospectives. Archives Jannis Kounellis — Les Manteaux Past: January 24 → March 9 In 2014, three years before he died, Kounellis produced in the Albicocco de Udine workshop in Italy a spectacular series of twelve large etchings (220 x 120 cm) with a very limited production run of just 12 copies. Archives David Hockney — New Photographic Drawings Past: January 24 → March 9 David Hockney does not claim to be a photographer. Rather, he is a painter who has used photography since the 1970s to capture elements of the world around him, which he observes with inexhaustible curiosity. 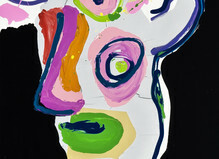 He then arranges, recomposes and reworks them in paint, producing what he describes as “Photographic Drawings”. Archives Fabienne Verdier — Ainsi la nuit Past: November 22, 2018 → January 19, 2019 For her first exhibition of paintings at Galerie Lelong & Co., Fabienne Verdier has chosen two new series of works Ainsi la nuit and Energie blanche. Archives Etel Adnan — Parler aux fleurs Past: November 22, 2018 → January 19, 2019 For this exhibition, Etel Adnan has produced a dozen dense and lively small round paintings, with a particularly supple and ample feel, focused on a single subject: flowers. Archives Marc Desgrandchamps — Latona Past: November 22, 2018 → January 19, 2019 Marc Desgrandchamps recently created three new lithographs for Lelong Editions on the presses of Atelier Michael Woolworth in Paris. The title of these lithographs, Latona, is discretely incorporated into each one of them. This is far from being a banal choice of name, as it evokes memories and popular and artistic culture. Archives Ana Mendieta — Cuba & Miami 1981-83 Past: October 13 → November 17, 2018 Galerie Lelong & Co. Paris is pleased to present Ana Mendieta: Cuba & Miami, 1981-83, a solo exhibition of large-scale photographs, newly-digitized films, and a rarely exhibited sculpture that tie together Mendieta’s native and adopted homelands of Cuba and the United States. Archives Joan Miro — Femmes, oiseaux et monstres Past: September 6 → October 10, 2018 Coinciding with the retrospective organised by Jean-Louis Prat at the Grand Palais in Paris, Galerie Lelong & Co is presenting a selection of works on paper from two decades (1930-1950), a period where the artist’s work reached its full expression. Archives David Nash — Columns Past: May 26 → July 13, 2018 Over the last fifteen years, Lelong Editions has regularly published collections of stencils and multiples by the English sculptor, David Nash. This exhibition presents the latest developments in this work. Archives David Hockney — Pictures of Daily Life Past: May 26 → July 13, 2018 A year after the triumphant retrospective to celebrate his 80th birthday (Tate Britain, London — Centre Pompidou, Paris — Metropolitan Museum, New York), David Hockney is back with a series of drawings produced on iPad and iPhone. Archives Jannis Kounellis — Boîtes — 1989 — 2015 Past: May 26 → July 13, 2018 Jannis Kounellis (1936-2017), who died suddenly a year ago, was one of the major protagonists of Arte Povera, a movement of radical artists that emerged in Italy in the 1960s. Archives Richard Serra — Double Rift Past: March 15 → May 18, 2018 Richard Serra (born in 1939) is a central figure of contemporary sculpture. His work, which can be found in many public and private collections around the world, mainly consists of monumental works made from Corten steel that play with the concepts of balance and mass. Archives Louise Bourgeois — Triptych for the Red Room Past: March 15 → May 18, 2018 In the wake of An Unfolding Portrait, the important and significant Louise Bourgeois retrospective at the MoMA, Lelong Editions presents a selection of emblematic prints, a number of which appeared in the New York exhibition. Archives Ernest Pignon-Ernest — Figurae, 1968-2018 Past: March 15 → May 18, 2018 Ernest Pignon-Ernest has always been sensitive to the heads of individuals, both male and female. Examining someone in detail through drawing was and is a constant feature of his work, a way of coming into direct contact with figures of recent History that he admires and questions. Archives Henri Michaux — Figures Past: January 25 → March 10, 2018 Henri Michaux, was both a writer and painter and always expressed himself with great freedom and independence. This exhibition presents a dozen works on paper produced around the 1970s with a common theme of the emergence or formal disappearance of one or more figures. Archives Etel Adnan — La vie est un tissage Past: January 25 → March 10, 2018 Today, the gallery is showcasing Etel Adnan’s woven work. Large colourful tapestries with sensitive lines, a joint collaboration between the artist and the Pinton studio, will decorate the walls of the gallery until 10 March 2018. Archives Juan Uslé — La noche se agita Past: November 30, 2017 → January 20, 2018 Juan Uslé is an artist who understands the meaning of time, not only theoretically but also practically. He paints with a deliberate slowness, often at night, to the rhythm of his beating heart, his breathing, after reading texts that encourage him to dream. He likes the vibrations of silence and hates to hurry. Archives Jan Voss — Ratures et pas de côté Past: November 30, 2017 → January 20, 2018 With this title, crossings-out and sidesteps, the artist is not content to simply question the idea of an accident and its creative virtues in the sphere of art: instead he invites the viewer to liberate themselves, and rid themselves of any sense of guilt. Archives Barthélémy Toguo — Strange Fruit Past: October 12 → November 25, 2017 Six months after his nomination for the Marcel Duchamp prize and his installation entitled Vaincre le virus, Barthélémy Toguo is presenting a series of works produced over the summer. The title of the exhibition, Strange Fruit is, of course, an evocation of the famous song by Billie Holiday. Archives Günther Förg — Bronzes et papiers Past: September 6 → October 7, 2017 From a young age, Günther Förg, (1952-2013), was one of that new generation of German artists, alongside Baselitz, Lüpertz, Richter or Polke, who refused to consign painting to the ranks of outdated media. Archives Antoni Tàpies — Temps, matière, mémoire Past: September 6 → October 7, 2017 Tàpies’ fame has taken on a singular and paradoxical form these days. He is so well-known around the world that it is no longer considered necessary to mention him as an inspiration for whole swathes of contemporary art. Giving basic graphic symbols their full power as primitive writings, has always been one of the objectives of the paintings of Antoni Tàpies. Archives Jaume Plensa — Nocturne Past: May 20 → July 13, 2017 For Jaume Plensa, prints are like a laboratory, offering him great freedom to experiment with the shapes and techniques that one often finds subsequently in his monumental sculptures. Archives David Hockney — The Yosemite Suite Past: May 20 → July 13, 2017 Between 2010 and 2011, working with an iPad, Hockney created a series of landscapes from the Yosemite National Park in California, capturing the silence of the nature — bare expanses and dense forests — as well as the movement of the visitors. 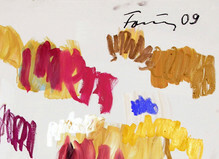 Each drawing, composed with his finger on the screen, is printed in a limited number of copies. Archives Konrad Klapheck — Derrière le rideau Past: April 6 → May 13, 2017 Konrad Klapheck has chosen to call this new exhibition “Behind the Curtain”. “There are many types of curtain, and a distinction should be made between the curtain that closes, pulled by a Mozartian viscount who wants to hide the liberties that he is taking with the attractive chambermaid, and the curtain that opens onto a theatre stage or a musical,” the artist explains. Archives Barry Flanagan — Petits bronzes Past: April 6 → May 13, 2017 Most people think of Barry Flanagan (1941-2009) as the sculptor of facetious hares. Galerie Lelong, which has been exhibiting the artist since 2004, has sought with its various presentations of his work to demonstrate that these emblematic Leporidae were just one part of his output, which was also minimalist and conceptual in the 1960s and 1970s. Archives Phillip King — Dans la couleur Past: February 1 → April 1, 2017 Phillip King is a major protagonist in the history of sculpture during the second half of the 20th Century. His work was noticed as early as 1966, during the Primary Structures exhibition at the Jewish Museum of New York, alongside Carl Andre, Anthony Caro, Dan Flavin, Donald Judd, Robert Morris and Robert Smithson. Archives Marc Desgrandchamps — Soudain hier Past: November 24, 2016 → January 21, 2017 For this first solo exhibition at Galerie Lelong, Marc Desgrandchamps has produced a series of 15 brand new paintings. These include large oil paintings playing with transparency and double exposure, painted with the confidence of someone who truly masters their art, as well as large gouaches on paper with precise lines and intense colours. Archives Sean Scully — Metal Past: October 12 → November 19, 2016 Metal is the name chosen by Sean Scully for his new exhibition at Galerie Lelong. With this word, he invites us to see the support hidden under the painting, exposing this material that reflects light, the central feature of his work. On these metals, the paint slides, the brush moves faster than on a canvas and the work as a whole becomes more animated. Archives Trio — Jannis Kounellis — Arnulf Rainer — Antoni Tàpies Past: September 8 → October 8, 2016 For this new Trio, Galerie Lelong brings together the works of three artists who placed the energy of the gesture at the heart of their production. Born in the interwar period, Tàpies, Rainer and Kounellis were part of that new generation who experienced the dramas of the 20th Century at a very young age but then also the intellectual, artistic and material emancipation. Archives David Nash — Columns, Peaks and Torso Past: May 19 → July 13, 2016 The British sculptor and designer David Nash lives in the small town of Blaenau Ffestiniog in North Wales where he works, usually with wood, while keeping a keen interest in the landscapes and nature which surrounds him. As a member of the Royal Academy his oeuvre is widely represented in the main museums across the world. Archives Pierre Alechinsky — Spires & résumé Past: February 4 → March 26, 2016 Pierre Alechinsky présente à la librairie de la Galerie Lelong « Spires & Résumé. » 18 épreuves d’une eau-forte sur cuivre, chacune imprimée sur vélin et quelques lithographies en couleurs des années 60. Archives Jaume Plensa — La Forêt blanche Past: February 4 → March 24, 2016 For his new exhibition at Galerie Lelong, the artist has used the faces of young girls to create figures in lightly-cracked wood that are then transposed into bronze. A matt white patina covers them bringing softness and serenity. “If the eyes are closed, it is to better underline the inner voice” Plensa tells us. Archives Jan Voss — À suivre… Past: November 26, 2015 → January 30, 2016 At 79, he continues to paint, cut out, glue and sculpt with total inhibition. His hands bring shapes and colours together as incongruous objects, mazes with no exits, sparse characters and improvised scenes. These new works manifest the “malicious interrogations” and “subversive games” that characterise Jan Voss’ “incessant quest”. Archives Etel Adnan — New Prints Past: November 26, 2015 → January 30, 2016 This new, more intimate, exhibition in the gallery bookshop presents some drawings as well as a selection of prints recently published by Lelong Editions. These are the artist’s first engravings, and they return to the simple themes that are so important to her. Archives Nalini Malani, Ana Mendieta, Nancy Spero — Trio Past: October 15 → November 21, 2015 Nancy Spero, Ana Mendieta, Nalini Malani: three women who, over time, have each earned a reputation as major figures of the contemporary art world. Although they were born in different countries and each has a very singular life story, their works have regularly come together during important group exhibitions organised throughout the world. Archives Ramazan Bayrakoğlu — Restless Past: September 10 → October 10, 2015 Ramazan Bayrakoğlu (1966, Turkey) uses photographic images with seemingly insignificant origins and appearances and then reconstructs them in large scale, giving them a plastic force which increases their impact. Archives David Hockney — The Arrival of Spring in Woldgate Past: May 21 → July 24, 2015 The acclaimed exhibition in 2012 at the Royal Academy in London showed the extent to which Hockney’s work includes a tangible mix of historical, traditional influence, and brand new medias, as demonstrated with these iPad drawings, featuring the Yorkshire landscape. Archives Günther Förg — The Large Drawings Past: April 2 → May 16, 2015 The finesse, the grace and the light touch of Günther Förg is in “The Large Drawings” more visible than ever, capturing and holding in suspension this luminous and inspired “almost nothing”. Archives Etel Adnan — Peintures Past: February 12 → March 28, 2015 Etel Adnan is a writer and painter. She was born in Beirut in 1925, and studied philosophy at the Sorbonne in Paris in the 1950s, then pursued post-graduate studies at Berkeley and Harvard. Since the 1960s, she has painted vibrant and brightly coloured small abstract landscapes. Her work became international recognized since her participation in the 2013 Documenta in Kassel. Archives Arco 2015 — Galerie Lelong Past: February 25 → March 1, 2015 Jannis Kounellis has been chosen to appear in the Solo Objects program with a spectacular work, a tribute to Yves Klein which has only been exhibited once before. Archives Rebecca Horn — Between the Knives the Emptiness Past: October 16 → November 22, 2014 For her second solo show at Galerie Lelong, Rebecca Horn is exhibiting a selection of mobile sculptures and large paintings on paper. Her sculptures continue the tradition of the animate object, a legacy of Dada, surrealism and kinetic art, making many literary, alchemical and sexual references. Archives Jaume Plensa / Kiki Smith / Barthélémy Toguo — TRIO Past: September 11 → October 11, 2014 Three artists from the same generation but from very different backgrounds: the Catalan Jaume Plensa, the American Kiki Smith and the Cameroonian Barthélémy Toguo. Three artists who over the last decade have forged an international reputation. Three artists who like to explore a variety of materials and produce two and three dimensional art works. Archives Sean Scully — Doric Past: May 15 → July 11, 2014 “Doric” is a cycle of large works that measure the same format, made up of various combinations of grey, black and cream and consist of three large panels assembled together. Sean Scully designed this ensemble in homage to Greece, indeed, in his own words, as a “love letter" to Greece, “a country to which we owe so much”. Archives Ernest Pignon-Ernest — Prisons Past: January 16 → March 29, 2014 L’exposition présente un ensemble de photographies et dessins liés à l’intervention éphémère qui eut lieu à la prison Saint-Paul à Lyon, où Ernest Pignon-Ernest et d’autres artistes ont été invités à intervenir en 2012. Archives Lin Tianmiao — Est-ce permis ? (Est-ce possible ?) — 可以吗？（可能吗？） Past: November 14, 2013 → January 11, 2014 Lin Tianmiao makes works that question Chinese society and its relationship with the antagonisms that run through it: past/present; masculine/feminine; tradition/globalization. Through her singular story, her work is radically different from contemporary Chinese contemporary production which is most often a synthesis of Pop-art and socialist realism. Archives Leon Kossoff — London Landscapes Past: September 12 → October 26, 2013 This exhibition in Galerie Lelong focuses on the artist’s drawings and paintings, depicting the city of London, spanning the artist’s career, from bomb-sites from the early 1950’s to a recent series of drawings of Arnold Circus. Many of these works have rarely been shown before. Archives Barthélémy Toguo — Hidden Faces Past: March 7 → May 4, 2013 Pour sa deuxième exposition à la Galerie Lelong, l’artiste couvre les murs de dessins et le sol de tapis tressés par des femmes bamiléké du Cameroun, afin de créer un lieu de rencontre favorable à la causerie, à la palabre. Archives Juan Uslé — De la luz silenciosa Past: November 8, 2012 → January 12, 2013 Juan Uslé is a sensitive and private artist who avoids the madding crowds and likes to be able to concentrate. Although apparently abstract, his painting is sustained by the observation of reality, a meditation on the artists he admires, and it oscillates between a romantic nocturnal pole and a baroque and brightly coloured solar pole. Archives Antoni Tàpies — Hommage Past: July 5 → 21, 2012 Exhibition in tribute to Antoni Tàpies : the artist was born in 1923 in Barcelona, Spain. He died in Barcelona in February 2012. Archives Kiki Smith — Catching Shadows Past: May 10 → June 30, 2012 Kiki Smith has a very personal take on all art techniques. Through these media she continues to explore the body, its organs, and the animal and plants of the surrounding nature. For this exhibition, she has focused on the theme of eyes both human or animal, and on Vision with all the connotations related to it. Archives Ana Mendieta — Blood and Fire Past: September 8 → October 8, 2011 Lorsque Ana Mendieta meurt à New York en novembre 1985, cette jeune artiste de 36 ans n’est connue que d’un cercle restreint. Son œuvre radicale n’a été exposée que de façon relativement confidentielle depuis 1976 et c’est l’exposition du New Museum of Contemporary Art, en 1987 à New York, qui commence à mettre en lumière la force de ce travail. Archives Jan Voss — De la pluie et du beau temps Past: May 19 → July 9, 2011 L’univers pictural de Jan Voss se déploie sur le papier. Ses aquarelles témoignent d’une joyeuse liberté des mouvements, des signes et des couleurs peuplent les toiles dans des dimensions parfois monumentales. 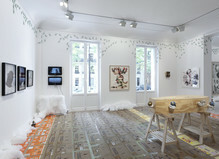 Le titre de l’exposition est à l’image de l’œuvre et de l’artiste lui-même. Son insouciance et sa modestie sont comme portées en étendard. Archives Klein — Kounellis — Feu / contre-feu Past: May 19 → July 9, 2011 Kounellis accepte le défi d’une exposition personnelle où il réagit, cinquante ans plus tard, à trois Peintures de feu de Klein qu’il a tout loisir d’installer parmi de nouvelles œuvres créées pour l’occasion. Ce n’est ni un hommage, ni une exposition de groupe, mais un dialogue par-delà les années. Archives Antoni Tàpies — Nouvelles peintures Past: February 3 → April 2, 2011 A 87 ans, l’inspiration et l’énergie d’Antoni Tàpies ne sont pas taries. Jouant des matières, bois nu, poudre de marbre, couvertures ou tissus collés, mariant son habituel vocabulaire de signes abstraits, de lettres, chiffres, croix, graffitis à une figuration récurrente, le grand peintre catalan est plus libre que jamais. Archives Louise Bourgeois — Estampes et dessins Past: February 3 → April 2, 2011 Voici 25 ans maintenant, la galerie Lelong faisait découvrir pour la première fois l’œuvre de Louise Bourgeois à Paris ; ce fut une révélation. Cette nouvelle exposition, dans l’espace librairie de la galerie, montre quelques dessins des années 40 et 50 ainsi qu’une sélection d’estampes allant des années 40 aux années 2000. Archives Günther Förg — Come, or the stellar tide will slip away Past: November 25, 2010 → January 29, 2011 S’il est un trait qui caractérise avant tout la peinture de Günther Förg, c’est la liberté. L’artiste n’est d’aucune école, d’aucune tendance, d’aucune chapelle : il peut peindre des fenêtres, des entrelacs, des paysages, des compositions quasi monochromes, ou bien encore ces constellations de touches colorées très vives. Archives Karel Appel — Gazing Heads Past: November 25, 2010 → January 29, 2011 En 1974, Karel Appel réalise une suite de douze peintures sur papier qu’il intitule « Gazing Head ». Il découpe un cadre, une fenêtre dans un papier brillant à effet de miroir qu’il colle sur une feuille. Puis il peint vivement une tête très colorée. une bobine, pourrait-on dire, qui surgit dans le cadre et dévisage le spectateur. 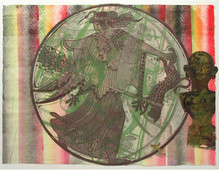 Archives Nancy Spero — Woman in motion Past: October 14 → November 20, 2010 Woman in motion consists of hand-printed and collage works on paper containing the visual vocabulary for which Spero is known: acrobats, goddesses, figures from art history and political imagery. This exhibition celebrates Spero’s women in cultures from ancient times to the contemporary. 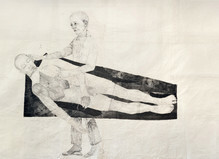 Archives Kiki Smith — Mortal, à la librairie Past: October 14 → November 20, 2010 Galerie Lelong presents an exhibition of works by Kiki Smith, including recent editions with a focus on the suite “Mortal,” twelve woodcut etchings related to her mother’s death. This work depicts the final stages of the life of the artist’s mother, imbued with a beautiful and strange intensity of grief and sadness. Archives Barthélémy Toguo — The Lost Dogs’ Orchestra Past: September 9 → October 9, 2010 Pour sa première exposition personnelle à la Galerie Lelong, Barthélémy Toguo a créé une sorte de théâtre invitant le spectateur à entrer dans sa perception du monde. Dans cette mise en scène, l’œil est aussitôt capté par des milliers de salamandres en porcelaine qui ont envahi, du sol au plafond, les vastes murs blancs de la galerie.